They attempted to insert secrets into the episode to set up the future episodes and plan to point them out in the commentary. Secrets included the Nibbler shadow; at several other points the group randomly said "Secret!" despite nothing important being on screen. Simultaneous countdown is a stretch. The sequence while Fry is frozen was inspired by The Time Machine. 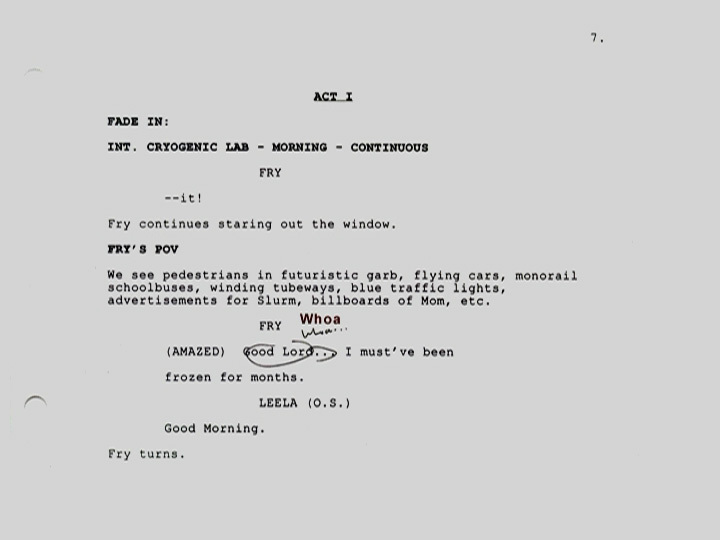 Script changed many times, but it was seen as important to end the cold opening in the future. 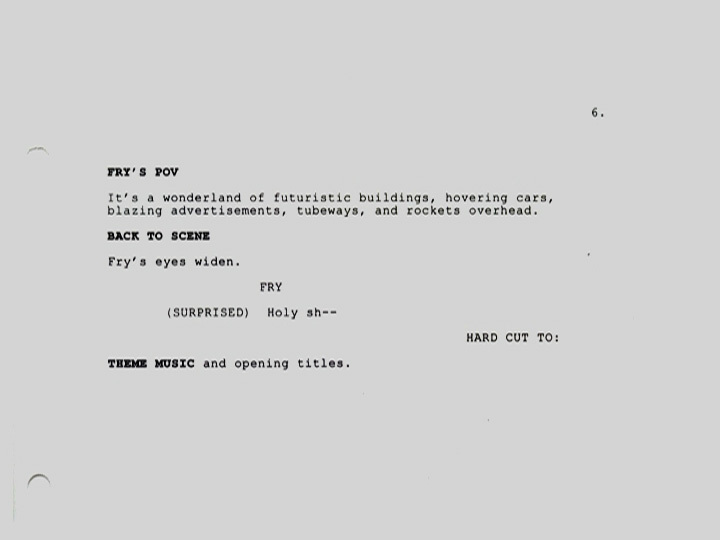 An early version of the script featured Fry being sold at an auction to the professor for spare organs. Another early version had Fry as a night watchman at the (1999) cryogenics lab. Fry was to be the captain of the ship. He may also have been an army man. 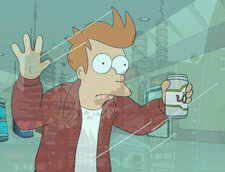 A removed scene featured flashbacks of important parts of Fry's life; Birth, College, etc. Such long scenes caused them to have two hours worth of material. The first shot of New New York was also the first 3D sequence in the show, and an experiment of sorts. It was decided all technology was to malfunction, much like it does in the present. Difficulties animating a cyclops, origins of the Leela character. Designers didn't want Leela's nose as big as it is, Matt had to push for it, the belief was that female leads had to have tiny noses. Bender used to have ear antennas. Fry's outfit is based on James Dean in Rebel Without a Cause. All designs in Matt Groening's style are intended to be recognisable from silhouette. Fox was shocked at the high ratings the pilot received and didn't understand most of the concepts, particularly the suicide booths. Bender's voice was what John DiMaggio thought the Professor should sound like. The Statue of Liberty was going to be robotic. Suicide booths are based on a Donald Duck cartoon, in which Donald went to a museum of the future and used coin-op devices that injured him. Career chips were going to be much more important. Cohen points out a sign with alien language one on it and discusses the languages. The group was thrilled to have "approval" from Leonard Nimoy, and to be able to still make fun of Nixon. Notes that the French language is gone. David X. Cohen: That's my parent's home address "405". It's a different street, but that's where the number came from. Matt Groening: Wow! Everything is of significance. Rich Moore: I think this is the first time we see Leela? Fox (a production note made on the script): Standard caution on the probulator. They note that they are aware Leela's armband is on the wrong arm. This page was last edited on 19 August 2013, at 06:07.